Operating on a non-discriminating basis under Special Use Permit, Tahoe National Forest. What would you do if you were several pitches off the ground and your partner took a serious leader fall and got hurt? Would you be prepared to handle the situation? These one-day workshops are for experienced climbers wanting to learn improvised self-rescue techniques with just the gear you normally take along on a climb. 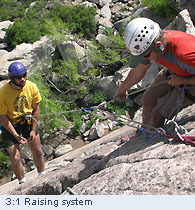 You'll study the best anchoring methods, along with raising and lowering systems for a one-on-one situation. This is a must for all climbers!